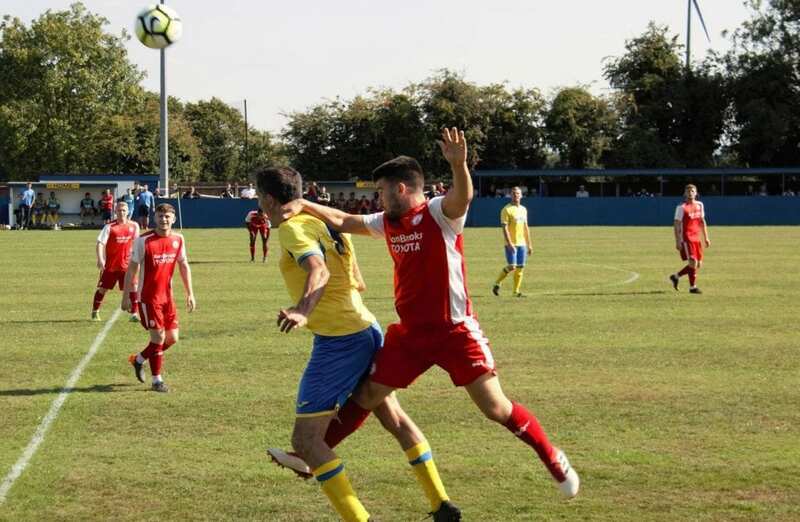 A hat-trick from Tim Hopkinson put Gedling Miners Welfare to the sword as Ilkeston Town ran out comfortable winners in the First Qualifying Round of the FA Vase in front of a bumper crowd at Plains Road. The Robins travelled to Mapperley topping the Midland Football League Premier division and, in what was their first venture into the FA Vase, there was early evidence they were in no mood for an upset as they began on the front foot looking toward their tricky attacking threat early on to cause problems. Jamie Walker registered their first shot on Gedling’s goal but his snapshot, after good work previously, flew over the crossbar. As expected, Ilkeston started the dominant of the two teams and their flowing football was commendable. They had the best chance to open the scoring on 8 minutes but, after the visitors counter attacked quickly, neither Alex Marshall, Lavell White nor Kyle Dixon could capitalise on a defensive error. The latter missing the target when it was arguably easier to score. They continued to press, however, and it was no surprise when, 2 minutes after squandering their best chance to lead, they went ahead. Following a Billy Bennett throw-in down the left, Marshall’s cleverly flicked header around the corner found Tim Hopkinson and the striker was left all alone on the penalty spot to pass over Danny Brown for the game’s opener. 3 minutes later and Walker, once again showing trickery on the edge of the area, tested Brown but the ‘keeper matched his effort superbly down to his right. Despite the start, Gedling showed no intent in lying down for their higher ranked opponents and started to display a more composed approach when in possession. The midfield trio of Liam Corrigan, Sam Mellor and Jimmy Spiers slowly ascended into the game and their link up play with Mason Coy and Dwayne Brown down respective flanks was looking promising. Ilkeston, though, remained resilient defensively and always looked a threat going forward. Bennett, this time, taking matters into his own hands on 18 minutes but his shot, through a congested penalty area, was once again matched by Brown who portrayed a busy figure in the home goal in the early exchanges. The pressure was continuous and Gedling found it difficult to venture out of their half for much of the first period and on 25 minutes, following a flurry of corners in succession, Ilkeston doubled their lead. After a quick corner caught Miners unawares, Dixon found time and space to delightfully his cross to the unmarked Hopkinson who duly dispatched his header past Brown for his second of the game. The ex-Nottingham Forest centre forward really showing his worth throughout and he may have had his hat trick shortly before the half an hour mark but his thunderous effort crashed off the crossbar before the ball was cleared. Despite showing early signs of potential, Gedling couldn’t find any rhythm, though they did have their fair share of possession throughout the first half but failed to really test Liam Mitchell in the Town goal. Dixon may have extended Ilkeston’s leader 10 minutes before the half but, in a carbon copy of the opening goal, his effort could only clip the outside of the post. 3 minutes later and following a fine deep cross from Thomas Marshall, namesake Alex’s header down into the ground bounced over Brown and the crossbar. The home side continued to push forward and, irrespective of the scoreline, were impressive in the final stages of the half. They registered their first real opportunity shortly before the break but, after Baz Payne was felled, Ross McCaughey’s dangerous free kick wasn’t met at the far post and the ball was cleared. 2 minutes later and they may have reduced the arrears headed into the interval but, after turning well to avoid any attention, Dwayne Brown’s delightfully curled effort from 25-yards skimmed the post with Mitchell beaten as referee Wayne Cooper concluded the half. Gedling came out the better of the two sides as it seemed the break was beneficial. Corrigan set about rectifying the deficit early in the second period but his volley from the edge of the area flew over. The home side continued to frustrate Ilkeston and the introduction of Bijan Pakrouz, replacing the injured Coy, was a positive one. His direct and pacey approach down the right started gave Ryan Whitehurst more to think about. In their first foray forward on 59 minutes, Hopkinson found himself in behind looking to put the game out of Gedling’s reach, but the committed efforts of Steven Brett and Charlie Roberts thwarted any chance. The game mellowed and it appeared Ilkeston had weathered any threat Gedling had posed and on 69 minutes they sealed the victory and comfortably confirmed their passage into the next qualifying round. After a long arrowed pass from Whitehurst excellently found Alex Marshall, the striker controlled and composed himself before volleying past Brown into the bottom corner to book a date with Graham Street Prims. Not looking to consolidate, Ilkeston continued to pour forward and the introduction of Malachi Lavelle-Moore was an appreciated one as the experienced forward, 5 minutes after entering the fray, played a key part in adding a fourth for his side. After he collected the ball in space, his through ball, aimed for Hopkinson, was met first by Brown but after the ball came loose, Hopkinson, from an extremely tight angle, found the far corner that sealed his hat trick as he celebrated with the travelling fans behind the goal. Respectfully, Gedling continued to press looking for a consolation and, despite the score, were extremely eager when venturing forward and should have been rewarded with their efforts. 10 minutes from time and after a fine McCaughey cross, Spiers couldn’t keep his effort down and Mitchell watched the ball curl wide of the post. 5 minutes later, and after some hesitant defending by Chris Shaw, Pakrouz found himself one-on-one with Mitchell but the former Notts County ‘keeper saved well with his body from a tight angle. At the other end, Hopkinson may have notched another next to his name on the scoresheet but, after good build up play between himself and Lavelle-Moore, Brown emulated Mitchell’s exploits and excellently saved with an outstretched hand. With the last attack of the game, the lively White failed to keep any real composure and, after being played in by Whitehurst, he blazed his effort over the bar. 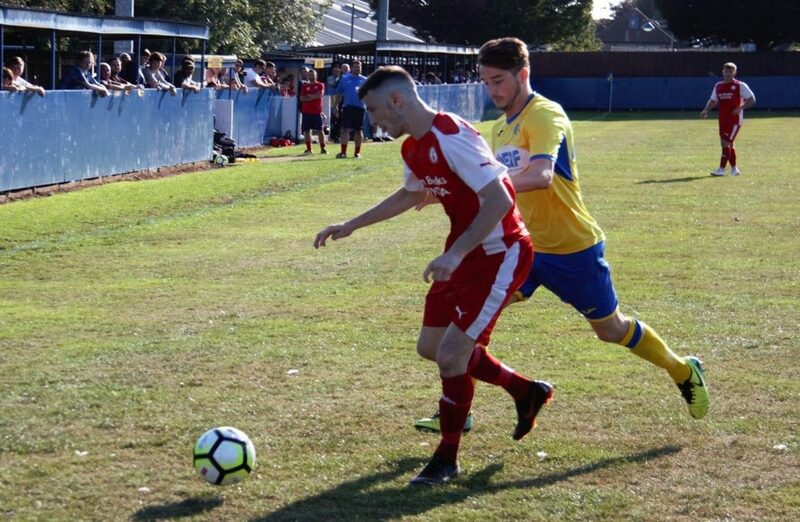 As Gedling bow out of the competition for this season, they can take plenty of positives from this performance against a higher ranked, and very well respected, outfit in Ilkeston. They were admirable in possession and certainly tested a team who will be favourites to clinch the MFA Premier title this season. They look to take this form into league action next Saturday (8th September) when Ashby Ivanhoe are the visitors to Plains Road in the East Midlands Counties League, kick off 3pm.